We are always honored to take part in special events like weddings. Aleca and Paul’s wedding reception was the perfect ending to a perfect day! Make us the life of the party or put us in a quiet corner. Either way, your guests will enjoy the coffee-house style atmosphere for your event. You will be sure to appreciate the small details and thought that goes into each beverage. Perfect for outdoor events on a hot day! We partnered with Grace Christian University’s student recruiting team to draw in potential students! 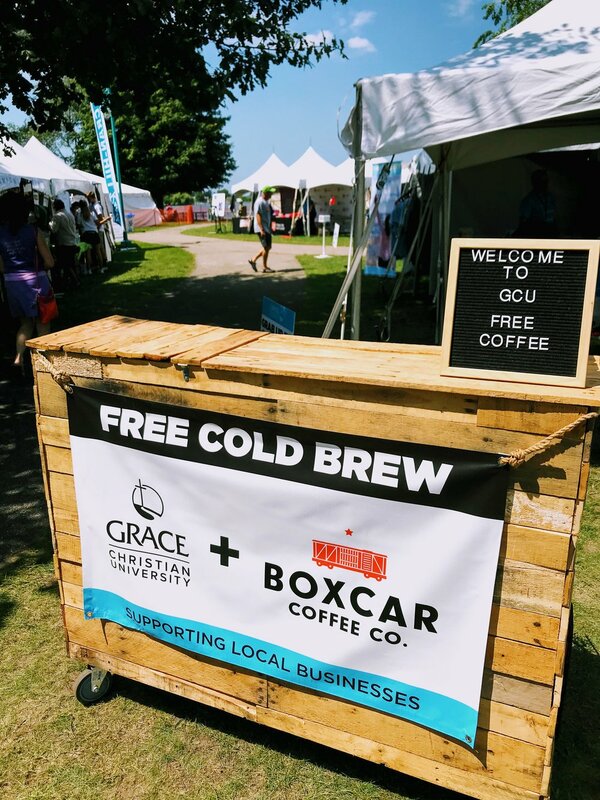 If you are expecting a large group of people at your event, serve them some cold brew coffee! Our delicious cold brew is put into kegs and served through our custom nitrogen tapping system. Serve it straight up, or mix in some milk and flavor, and you will have quite the crowd-pleaser! We were honored to be a part of Jenna and Matt's beautiful wedding reception! We will bring a large brewer and all the necessary cups, lids, and coffee accessories. We will grind the coffee and provide instructions for the brewing process so that you can just plug and play. Guests will serve themselves from our provided airpots. Cream, milk and sugar will all be provided. $40 per LB. of coffee purchased. No delivery or rental charge. We will work with you to deliver and pick up coffee supplies when convenient.